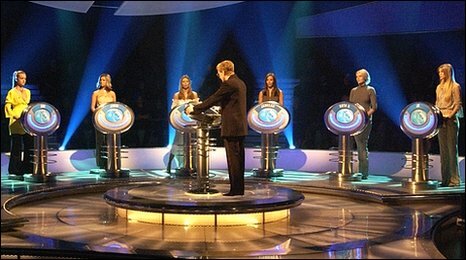 With 1,693 episodes over 12 years, 15,000 contestants, 230,000 questions and countless jibes from its sarcastic presenter Anne Robinson, The Weakest Link was one of the BBC’s most successful quiz shows. I became one of those 15,000 hopefuls in 2007, in my first ever show. The audition was held at the Great Northern Hotel in Peterborough. I remember meeting one young would-be contestant in the lobby who’d brought his mum along and was a bit disconcerted at having to leave her behind when invited into the audition room. ​Once there, after introductions, we were invited in to play the game. Beads of sweat were already forming on the forehead of this lad before he’d answered any questions. I really wanted to ask him whether he was quite ready to put himself in front of the cameras. After playing the game a couple of times and only flunking one question our time was up and it was a question of waiting for the call back. Good news followed quite quickly with a filmed date confirmed at Pinewood Studios, the birthplace of a number of Sixties James Bond classics. This first gameshow experience was one where everything was new and unfamiliar, from the length of time it takes to shoot a show (up to three hours for a 30 minute episode) to relaxing in a green room full of complete strangers. Meeting fellow contestants was a lot of fun and after a briefing of the rules, we were ushered into a chilly studio, sadly with no sign of the nervous young applicant I'd met earlier. After a few practice rounds (this was back in the old days when you were equipped with pen and a white board), we were off. Pretty much straightaway, the tension built up. When it’s clear that the questions are heading your way, your heart rate increases. It’s a fine line between being alert and ready to respond to questions and being an excitable mess and it’s fair to say I was closer to the latter! Following the first round, with every contestant answering correctly, it was time to vote someone off. A lady who’d flown down from Scotland was most disgruntled at having to leave despite performing well in the first round. Wearing a bright yellow top was my theory - being noticeable in shows like this was not helpful. I survived two more rounds, before having a ‘brain freeze’ when asked what the word for starter was, in Italian. I did a good impersonation of a goldfish before walking off to complete my exit interview. Looking back, I was really glad to have been part of a classic show and if there’s one thing I learnt, it’s that being calm and relaxed is just as important as having the right knowledge. Anne: Which actress named Patricia is the wife of Nicholas Cage? Anne: In what European Country was Antonio Banderas born?